If you find a feeling of helpless despair descending upon you every time you open up your email inbox, help is at hand—you can get on top of your messages without hiring a personal secretary, and we're here to show you how. Offering a prescriptive, step-by-step method that's going to work for everyone seems a futile exercise, as we all use email differently in our personal and professional lives. Instead we've come up with some of our favorite techniques and apps to take charge of your incoming mail—you can pick and choose the ones that work best for you and your workflow. Where possible we've tried to talk in generic terms that will work for any email client and service, though we have included some more specific tips too. Let's get to it. You're the boss: The amount of time you spend dealing with email shouldn't be dictated by how many messages you get, or how many times your phone buzzes. It should be set by how much time you need to spend on the task. An hour a day? 30 minutes? Recent figures suggest we spend about a quarter of our office time working with emails, so anything under this and you're already ahead of the game. The trouble with checking your email so often is that it usually involves just that—checking—without any kind of process or action. Not only does it take up time, it distracts you from whatever you were doing beforehand. You need to set parameters for yourself, and stick to them. Cut down on the number of times you look for new messages and decide how much of your life you want to spend in your inbox. Anything you don't deal with in that time, mark as read and archive (or delete). Close down Outlook. Shut that Gmail tab. Disable sync on your phone. And don't check email first thing in the morning if you can possibly help it. Write long emails elsewhere: When you really need to invest time and energy in an email (for job applications, perhaps, or writing to a loved one on the other side of the world), use a program other than your email client (such as a plain text editor). This avoids the urge to check for new messages or browse through the latest bulletin from your favorite band every time you pause for thought. You can then paste in the fruits of your labors the next time you're due to venture into your inbox. You don't have to read emails: This is why the "mark read" option and the "subject" and "sender" columns were invented. 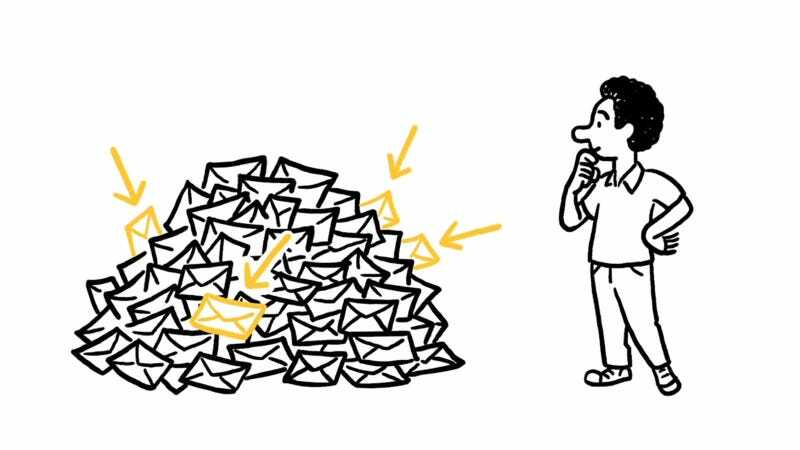 Before you even open up an email and waste valuable seconds scanning it, you already have a good idea of whether it's actually any use. If you don't get around to these lower-level messages, don't let them languish. Just trash them. The world won't end, and if it does, inbox management systems are the least of your concerns. If your email client has a preview feature, turn it on. Use the alternatives: It's a safe bet that your office fire alarm system is a loud ringing bell rather than a company-wide email shot. Likewise: Don't use email when there are better alternatives. For example, get into the habit of speaking to colleagues face-to-face or using Twitter to replace all of those email newsletters you're subscribed to. Email has become the standard tool for everything from family announcements to software bug reports, but the more you make use of more efficient alternatives, the quieter your inbox will become. Filter in rather than filter out: Many of us have gotten used to filtering out emails we don't want to see. If you get a lot of incoming messages, it's a better idea to filter in the really important stuff. In Gmail, for example, you can mark messages from particular senders as important as part of the Priority Inbox feature. In Outlook, you could create a filter to flag emails from your most significant contacts. Focus your efforts on these important, filtered-in emails, and if you have any time left over give the whatever other messages you receive a quick once-over before archiving or trashing them. Guard your email address: Restrict access to your address and make it harder for people—marketers, especially—to reach your inbox. You could direct people (be they colleagues, clients or friends) to an alternative platform such as Twitter or Skype if they want to get in touch with you, perhaps. Here's a tip for Gmail: you can insert dots anywhere in your address and it won't make any difference, so mr.smith@gmail.com and mrsmith@gmail.com lead to the same account. Use one alternative in all of the trivial Web forms you fill out and you can set up a filter to archive or mark as read all of the messages coming in to this address. ActiveInbox (Chrome/Firefox): An extension for Firefox or Chrome, ActiveInbox gives you a set of tools to help you treat emails as tasks and power through them more efficiently. Prioritize your most important messages, group emails together based on projects, and tick off emails that you've dealt with. Boomerang (Chrome/Firefox/Safari): Boomerang plugs right into your Gmail inbox to give you a set of extra features, including the ability to schedule when emails are sent, and the option to have follow-up reminders appear if someone hasn't got back to you. If you can't deal with a conversation right away, you can snooze it for later. Visit the official website to download the extension for your browser. Customizable Tabs (Gmail): Gmail's latest trick might also be its handiest; a new layout for web and mobile that just started rolling out this week automatically sorts your emails into tabbed categories like Primary (actual acquaintances), Social (Twitter, Facebook, etc. updates), Promotions (all your Groupon offers), and Updates (order confirmations, flight information, and the like). You can also customize both how many tabs you use from one to five, and designate certain senders to always appear in a given tab. All Gmail users will get the tabbed view eventually, but if you want to try it sooner, watch for the Configure inbox option to appear in your Gmail settings menu. Dextr (Android): Dextr works on the 'filter in' principle. It helps you set up a whitelist of people you want to hear from, and all other emails are hidden away ready to be checked when you have time to deal with them. Still in its beta development stage, you can pick up Dextr for $1 on Google Play. Mail Pilot (iOS): Mail Pilot turns your inbox into a to-do list, although if that sounds like something that would work for you, you'll have to lay down $15 to get it from the App Store. You can mark emails as done, assign deadlines to them, and get on top of your messages from the comfort of your iDevice. It's a hefty price to pay, but no one ever said Inbox Zero comes cheap. Mailbox (iOS): You've no doubt seen plenty of news about Mailbox, most recently bought by Dropbox. Inbox zero is the goal of the app, and it helps you achieve this by simplifying your Gmail account—messages can be dealt with, archived, deleted or snoozed until a later date, enabling you to work through the most important emails and leave the rest. Mailbox is free from the App Store (and there's no waitlist any more, either). Priority Inbox (Gmail): Gmail's Priority Inbox feature launched in 2010, and if you're not using it then it's worth a look. It attempts to automatically weigh up which emails are most important to you, letting you focus on these and catch up on the rest another time. The best part is you can train Gmail to recognize important and unimportant messages so it gets better over time, and the Priority Inbox feature can be carried over to Gmail's iOS and Android apps so you only see significant messages. Log into Gmail to use it. Sanebox (multiple): Sanebox works with just about any email service on just about any platform, and does a similar job to Gmail's Priority Inbox. It will only interrupt you with really important emails (and you can help train it to recognize these) while everything else is archived for later. An easily digestible summary can be sent as often or as rarely as you like. Prices start from $2.04 a month, but you can sign up for a free trial from the official website. Scoop (Web): Scoop gathers up all of those daily emails that pepper your inbox and summarizes them into an easily digestible one-shot. All of the magic is done in the background, so you don't have to train the service, but you can tweak Scoop's settings if it gets something wrong. All processed emails are archived immediately and labelled as "Scooped" so you can check them if required. More information can be found at the Scoop website. Unroll.me does a similar job. Triage (iOS): Triage is another app hoping to simplify the process of wading through your emails. Incoming messages can be archived, replied to or kept in the inbox for dealing with later, all with a flick of your finger. The app is available for $2 from the App Store. As ever, we'd welcome your input in the discussion below if you've found a killer app or philosophy that has helped you keep a clean and tidy inbox.